Time for a quick family room update! I’m quite excited to finally have a plan set in place for this empty room. I’m not joking when I say we’ve been living with just the bare minimal since we’ve moved in—one small sofa and our TV sitting on top of a side table. Both the hubs and I agreed that we wanted to create something cozy and functional but still stylish enough to fit in with the rest of the decor of our home. With an awkward floor plan, narrowing down a layout was quite the challenge for us. We spent way to much time going back-and-forth about tv placement, furniture layout and whether or not we’re making wise purchases that will eventually be “baby friendly”. It’s a lot to digest but in the end, we formed somewhat of a plan. Although things will change along the way, here is what we know will take place for sure. The gas fireplace is our next major project in the space. It’s old, hardly working and sort of an eyesore right now. I’m happy to say we will be replacing our old unit with a new Napoleon Fireplace, which I’m super excited about! The mantel and mirror will be staying but I have some big DIY plans to change the look completely. Ever since we laid eyes on this Crate and Barrel Lounge sofa 5 years ago, we swore to ourselves that eventually one day we would own it. I’ve been crushing on Dash & Albert wool rugs for sometime now. 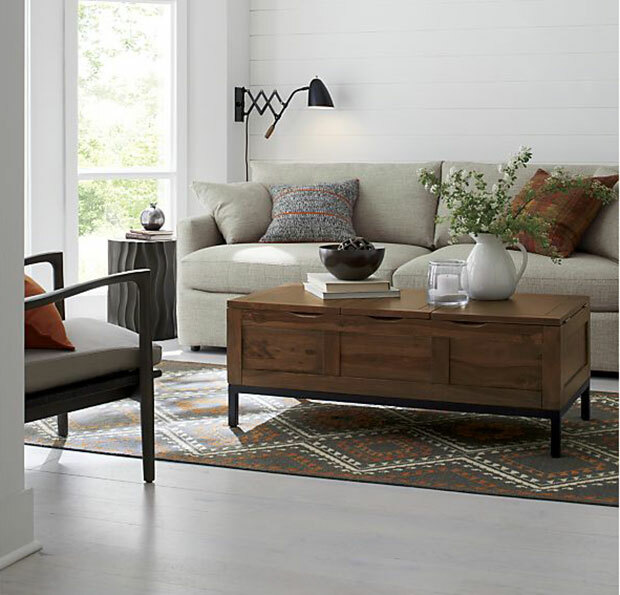 Although we’ve installed new hardwood floors, nothing screams “cozy” like a big area rug. I love the classic look of the diamond weave pattern. 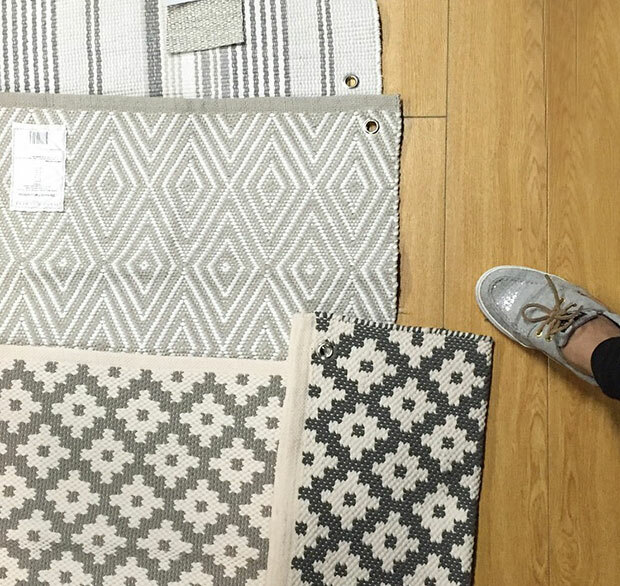 Paired with the fabrics in the space already, this rug is going to bring in a lot of warmth and texture to the room. For the media console, we are doing an IKEA hack. I have this vision in mind that hopefully works out! 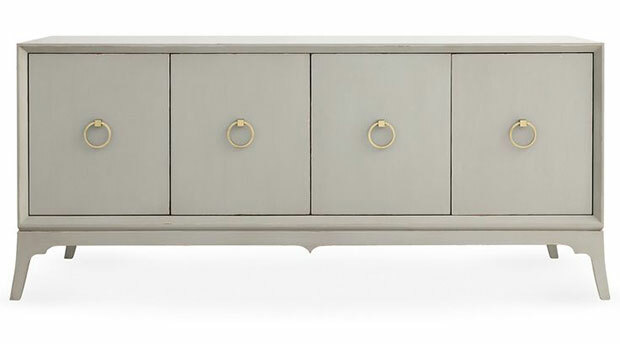 My inspiration comes from this lovely piece, The Redford House Bennett Entertainment Console. I love everything about this unit except the hefty price tag. The IKEA hack will have a similar profile and features; however, I’m using a different colour palette better suited for the room. With just a couple of things left on the to-do list, we’re almost ready to put everything together. I can’t tell you how much I’m looking forward to kicking my feet up and relaxing with this growing belly! UPDATE: Check out the full family room reveal here. I love redecorating! And you are doing a fantastic job, looks amazing! i hope we all get to stay updated with the progress! This is absolutely gorgeous!! I love your style board, making them is one of my favorite things to do! I love your color scheme and that rug – to die for! I can’t wait to see the finished product!! That console is on Fire! Love the neutral vibe that you are going with. I thought for sure the mirror above the fireplace would be going, but I love your inspiration pictures. It will work really well! Good luck.